Quite a few Warhammer games played today, mostly friendlies rather than club competition games. The current standings in the ladder are on the Competitions page. 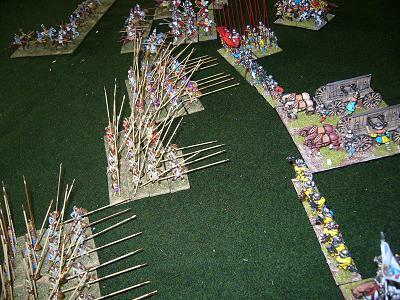 The approach of Push of Pike has brought out a few early DBR armies for practice games. WHFB - Matt (Orcs and Goblins) beat Nick (Empire). WHFB - Dan (Skaven) beat Rob (Empire). WHFB - Matt (Orcs and Goblins) played Glen (Wood Elves). WHFB - Kit (Orcs and Goblins) played Ian (Orcs and Goblins). WHFB - Matt (Orcs and Goblins) played Dan (Skaven) in a skirmish game. DBM 15mm - Paul's Ottoman Turks gained a near-run victory over Lawrence's Hungarians. DBMM 25mm - Andrew (Early Crusader) v Robert (Medieval Portuguese). This was the first outing for Rob's new Portuguese army without English allies in this game. The Portuguese knights charged the great masses of crusading infantry inflicting lots of casualties. However, the crusaders held on and managed to destroy enough knights to defeat the Portuguese army. 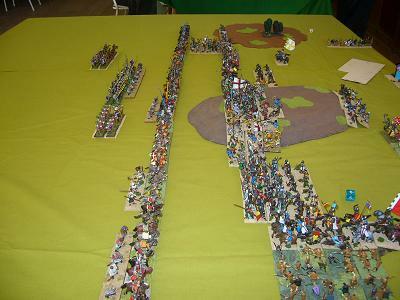 DBR 15mm - Ian (Venetian) v Scott (Swiss). Both armies took lots of damage, resulting in a 5-5 mutual break. 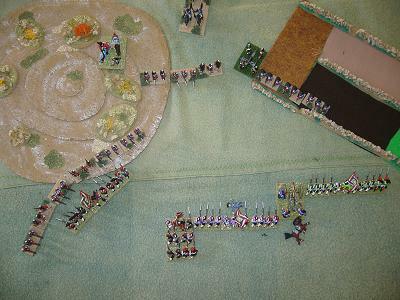 DBR 15mm - Lee (Early Tudor English) beat Andrew (Neapolitan Spanish). 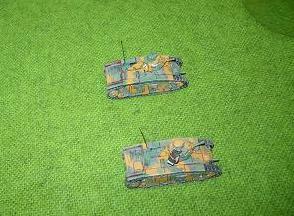 Flames of War - Kieran and Michael had a game, both using Italian armies, with the win going to Michael. WHFB - A doubles game with a crowded battlefield. On one side was Dan and Rob, and opposing them was Aaron and Matt. PoW Napoleonics 15mm - Scott and Philip played a game of Principles of War Napoleonics using the French and British armies in Egypt in 1801. The British were defending a line of hills with a small village located at each end. The attacking French army was larger than the British, but some parts of their army arrived later in the battle, too late in fact to take any of the objectives. The piecemeal French attack was defeated by the British firepower. The North Island convention was held in New Plymouth over Queen's Birthday Weekend. Our expeditionary force was competing in DBM 25mm, DBR 25mm, Warhammer and Flames of War. Robbie's Beastmen won First Place in WHFB and Nick was Second with an Empire army; Brett's Medieval Germans won First Place in DBM; Grant was 1st in DBR, Andrew second, and John also picked up several good wins that would have won him a medal if he was competing rather than umpiring. The convention was held in a very nice venue at the racecourse, with plenty of space and light making for pleasant gaming surroundings. Catering was excellent too, and a ravenous Beastman reported himself satisfied with the cakes and ginger slices. 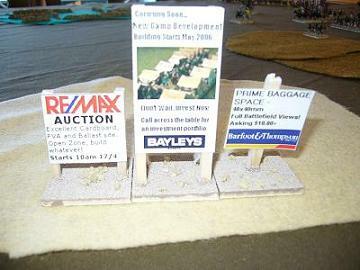 The Bring-and-Buy was rather sparse this year, other than Andrew's No Mans Land terrain which did good business as usual. NICon 2007 will be held in Cambridge. A 25mm DBR game between Kelly's Indians and John's Japanese. WHFB - Three games of Warhammer today, but not many details to report right now. Games between: Brett and Ian, Rob and Glen, and Mark and Dan. DBR 15mm - John (Italian Wars French) played Philip (Knights of St John). 10-0 to the French. 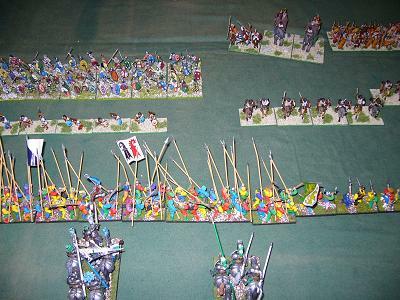 DBR 15mm - Lee (Lancastrians) played Philip (Knights of St John). 9-1 to the Knights. 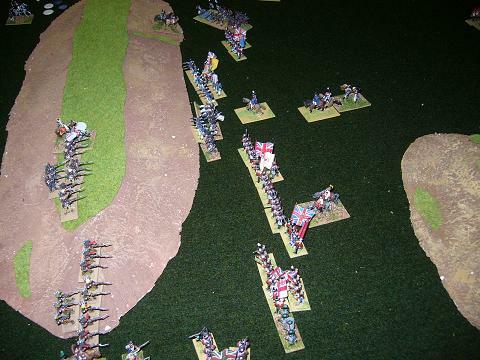 DBR 15mm - Lawrence (Spanish Imperial) played Scott (Swiss). The CWC has a new online forum http://www.chchwargaming.org.nz/forum/index.php The forum is by no means only for Christchurch wargamers, it is intended as a place where gamers can go to ask questions about a particular gaming genre (including role playing and non-GW games) as well as painting, modelling, off-topic, etc. One forum topic that might be of interest to some ancients players is "How to beat Martin." The Battle of Salamanca, replayed using Napoleon's Battles rules and 15mm figures based for Principles of War. The British and Portuguese infantry are about to complete the victory sweeping away the remnants of the French infantry defending a ridge line. WHFB - Rob's Beastmen and Nick's Empire played a warm-up game for Nicon, resulting in a draw. WHFB - Rob then successfully defended his place on the ladder with a solid victory over Matt's Ogres. WHFB - Aaron's Lizardmen played against Russell's Empire. Result unknown at this time. DBM 25mm - A doubles game between Andrew and Philip (Han Chinese) and Paul and Lawrence (Burgundians). There were a lot of large hills on the table, and many of the infantry from both armies spent the entire battle hiding behind them. A large Chinese flank march arrived but was defeated when the Burgundians redeployed their knights to face it. The battle was a 9-1 win to the Burgundians. Charles the Bold survived the battle, but his English ally will never get to be king now. Shattered Lances - Brendan and Craig had a game of SL, Romanian Franks versus Rumi Seljuqs. Napoleon's Battles - Brett and Kendall played the Salamanca scenario, bringing out our old favourite Napoleon's Battles rules. The figures were still on Principles of War bases, but the game still worked. It is a difficult scenario for the French, and they were defeated by the British Peninsular army controlled by Kendall. Thanks to Andrew and his band of helpers who sorted out the storeroom today. The broken tables and trestles have been removed, and the remaining gear is now tidily stacked on racks on the wall. There is also a club noticeboard, which looks very like the old red tabletop. Napoleonics made a return to the club, with a couple of rule systems being used, Grand Armée and Volley and Bayonet. The period has been dormant at the club for several years, although many of us have Napoleonic armies. There seemed to be enough interest in the games that we might expect to see more in the coming months. WHFB - Ian's Orcs massacred Aaron Jnr's High Elves. WHFB - Daniel's Skaven beat Russell's Empire. WHFB - Matthew's Ogre Kingdoms beat Rob Jnr's Empire. The last two games were ladder competition games. The top three placings are now Rob Snr, Matt, and Rob Jnr. DBM 25mm - John M made the trip over from Auckland bringing his Middle Imperial Romans to play against Philip's Kushite Egyptians. 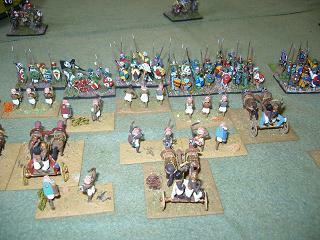 Very early in the game some Roman horse archers mobbed an Egyptian sub-general, and his command disappeared in rout. The main body of Egyptian cavalry defeated the opposing Roman cavalry, but too late to affect the outcome of the battle which was decided when the legionary centre advanced and defeated a couple of Egyptian commands without loss. 9-1 to John. DBR 25mm - John W and Andrew played a 200AP DBR game, illustrated below. The armies were modelled on the Oda clan Samurai army and the Monks and fanatics of the Kaga Ikko-Ikki sect from the Hongan-ji monastery fortress. True to the historical result, it was a win to the monks. Grande Armée - Kendall and Brett tried out these rules for the first time. The game was a win to the French over the Prussians. Volley and Bayonet - Grant (French) defeated Rob (Duchy of Warsaw). There's a new set of wargames rules for modern war that have just come onto the market... Metal Storm... by Hammer-Wargames. They include armoured vehicle points builder system that allows any vehicle to be created, so doing away with the need for huge lists, also a big part for civilians and even the media, intriguing ? The rules also include ultra-modern style of warfare, with special forces, insurgents, terrorists, rapid deployment, etc. If you would like to pop into the yahoo group and have a nose around the files and photos and a few of the posts you may be interested in the period. If you play AK47 you will feel very comfortable with these new rules, you may even be a member of the RFCM group if so you will definitely know Roy aka Hammer. The rules are very different but easy and very playable as you will gather from the many posts on the forum. It's worth a quick look for the photo files alone…. It was good to see a busy club meeting today with some new members as well as us old timers. There were three games in the Warhammer ladder competition, and we saw the first 25mm DBR game at the club. WHFB - Aaron's Brettonians took on Dan's Skaven. WHFB - The Empire under Russell's command was defeated by Matt's Ogre Kingdoms. "I ground their bones, and ate them, and stuff." WHFB - Rob Snr (Beastmen) played Rob Jnr (Empire). While the Empire cavalry were galloping across a fairly open plain, the beastmen arrived on the flank and emerged behind the Empire lines. The win went to the Senior player. DBM 15mm - Lawrence (Later Hungarian) beat Scott (Ottoman Turks). One Hungarian general came to grief against Turkish horse archers, but otherwise it was a great Hungarian victory. 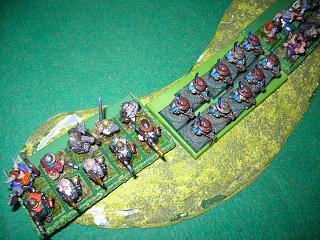 DBM 25mm - Brett got out the old plastic club Roman army and took on Paul's Burgundians. A win to Charles the Bold and his band of Burgundians. DBR 25mm - Andrew used a Manchu Chinese army to defeat John's Japanese. There was mist throughout the entire battle, which hindered the Chinese plan for a double envelopment and restricted the benefits of their long range artillery. Nevertheless it was still a comprehensive victory to the Chinese army. 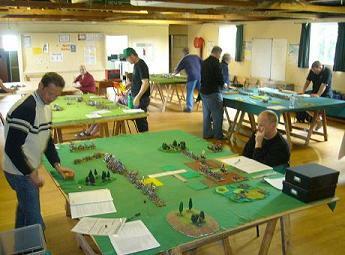 This was the first 25mm Renaissance game played at the club, and we are expecting to see many more this year. Flames of War - Kit's Sikh Rifle Company got a 6-1 win over Steve's German panzer force. It was a fine performance by the Blacker Bombard. The card game Illuminati also made an appearance which kept us amused for a while (but without a clear result at the end). This year's national convention was held in Hamilton. We had a good contingent attending from the NSWC playing in DBM 15s and 25s, Flames of War, Moderns, and as usual making up most of the DBR competition. Warhammer was a very small competition, and had no North Shore players this year. Rob's won second place in the Early War section of Flames of War, using a NZ Rifle Company. Andrew's Early Crusaders picked up the prize for Best Painted Army in 25mm ancients. Our other Ancients players missed out on the medals this year and got some of the middle places in the competition. The final of the DBR competition was between Philip (Muslim Indians) and John (Later Danish), with the win going to Philip. If there was an award for the best baggage, it would have gone to Stu's Alwa camp! There was a good variety of armies in the competition: Muslim Indians, Later Danish, German Catholic, Scots Covenanters, Valois French, Swiss, Persians, and the Alwa. Natcon 2007 will be held in Upper Hutt. Less than a week to go before the Nationals at Easter, and there were several training games happening at the club, and some games in the new Warhammer competition as well. WHFB - Dan's Skaven won a solid victory over Aaron the Elder's Empire. The Empire's foot wasn't of the highest quality other than a unit of Greatswords adding some strike power. The flagellants spent a lot of time flailing around against the rat swarms. WHFB - Aaron the Younger's Brettonians got a minor victory in a game against Matt's Orcs and Goblins. Brettonian horse won 'Man of the Match' award in this battle. WHFB - Rob the Younger and Russell had a battle both using Empire armies. It was a minor victory to Rob. Shattered Lances - Brendan (Fatimids) had a battle against John (Crusaders). Early success by the Crusader centre was turned around as the flanks were gradually worn down by the Fatimids. Casualties were high on all sides before the Crusaders succumbed. DBM 25mm - Andrew (Early Crusader) beat Nick (Patrician Romans) 9-1. The crusader foot did very well to defeat the warbands and knights attacking them, although the pilgrim hordes on the flank were beaten by the Roman auxilia. DBR 15mm - Philip (Muslim Indians) beat John (Later Danish). Lots of sixes and cheap shots to give an undeserved win to the Indians. DBR 15mm - Ian (Scots Covenanters) and Kendall (30YW Protestants) fought to a 5-5 mutual break. The Scots made a successful attack on their left flank sweeping away an opposing command. In the centre a slogging match ensued in a large area of rough terrain. While all that was going on, a cuirassier force was marching around the Scottish right flank. It fought its way through a blocking force of Scots pikes and was then into the Scottish baggage camp. Flames of War - An early war game between Rob's NZ infantry from the Greek campaign with British armour against Kit's French army. On one flank the artillery were having a hard time of it, being attacked by six Char Bs. Meanwhile the British light tanks made their way to an objective on the other flank, their way cleared by a successful infantry fight. A 4-3 win to the Kiwis. 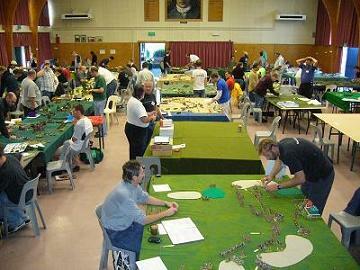 The Taranaki Miniature Warfare Society Inc (aka Taranaki Old Guard) invites you to New Plymouth to join us for the 2006 North Island Wargaming Convention. Venue: La Mer Lounge - New Plymouth Racecourse (Members Grandstand), Pukekura Racecourse Function Centre, off Coronation Ave, New Plymouth. Centrally located, onsite Catering/Bar, Sunday Prizegiving Dinner on site. 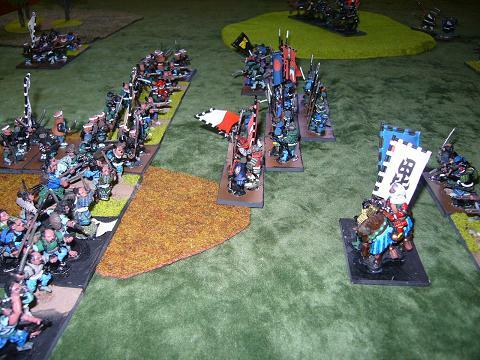 WHFB - In the Final of the 2005 club competition Rob Snr used an Orc and Goblin army to defeat Aaron's Wood Elves. WHFB - Rob Jnr used Dwarves to beat Matt whose Orcs and Goblins were shot to pieces. The picture here shows some of the shooters deployed safely on a hill at the back of the table. WHFB - Dan's Skaven defeated Russell's Empire army. WHFB - Nick's Empire beat Brett's Orcs and Goblins. DBM 25mm - Lee's Macedonians (under the command of King Philip with Alexander as a sub-general), defeated Andrew's Early Crusaders 10-0. The crusading hordes made a gallant but unsuccessful attempt to contest a hill on the flank against Thracian auxiliaries. Meanwhile in the centre of the table the Macedonian phalanx and Greek hoplites eventually wore down the Crusading infantry. DBR 15mm - Philip (Muslim Indians) beat Scott (Dutch Rebellion) 10-0. DBR 15mm - Philip (Muslim Indians) beat Ian (Scots Covenanters) 9-1. Mostly Warhammer at the club today, with the semis of the club competition being the highlights of the day. DBR 15mm - Philip (Muslim Indians) vs Scott (Spanish Imperial). A very closely fought game (only 1 element in it at the end) finishing with an 8-2 win to the Indians. The end-of-day boardgame was Riddle of the Ring. The three hobbits outplayed the four black riders and eventually Frodo threw the ring into Mount Doom. Nice to see the rules can produce a historical result. The Annual General Meeting was held today, and it was a fairly low key affair. There was some discussion of club terrain and tables, competitions, and membership fees. Membership for 2006 is $30, or $5 a meeting for casual visitors. WHFB - Some games between Aaron and Dan - sorry, no more details at the moment. DBM 25mm - The Ancients Competition semi-final between Lee and Brett is illustrated to the left. It is a stirring sight to see the phalanx advancing in echelon, but they never made contact as both their flanks were broken by the Germans and their Swiss allies. Brett now goes on to play Jono in the finals. DBR 15mm - Philip (Muslim Indians) beat Ian (Scots Covenanters) 9-1. On one flank the Scots' Royalist allies were enveloped and destroyed by Sipahis. The Maratha allied contingent attempted to do the same on the other flank but were swept away by musketry. The battle was decided in the centre where the Indian blades with a few cavalry in support defeated the main Scottish command. Flames of War - Rob (Brits) played Mark (DAK). Flames of War - Kit's Sikh Rifle Company defeated Kendall's Germans. Things were not going well for the Sikhs until the German Stukas began bombing their own artillery, and then the British Matildas arrived and turned the tide. It was a very quiet meeting indeed, as many of us were at the Battlecry tournament. There was just one game played. WHFB - Aaron Snr (Empire) beat Russell (Tomb Kings). The Imperial artillery instrumental in holding off the horde of Undead chariotry. The Tomb King army crumbled after the Heirophant was shot down by handgunners. Battlecry 2006 had over 120 participants and featured Warhammer 40K, Flames of War, and the 5th DBMM 25mm doubles tournament. There was also a lot of roleplaying games happening at the convention. Our club was represented by Kit in Flames of War, and he won First Place with a mid-war Sikh Rifle Company. We had three teams in the DBM 25mm Doubles competition: Andrew and Philip (Early Crusaders) who won 3rd place, Brett and Nick (Hungarians), and Stu and Ian (Swiss). The Early Crusader's fleet and baggage camp. 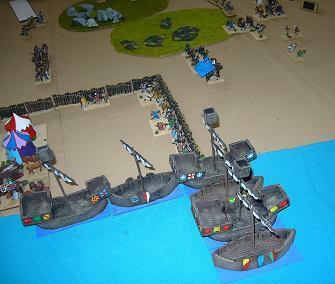 The ships, fortifications and tents are Andrew's own No Man's Land models, and the Crusader army is mostly Old Glory models. On the other side of the battlefield are the massed flank-marching crusader pilgrims, including the much admired Morris Dancing element! Carthaginian elephants and Gallic warbands advance on Swiss pikes and Milanese knights. The paper - scissors - stone aspect of DBM is clearly evident here! There were a few visitors from the AWC today, and we had a good number of games happening. WHFB - In the Warhammer Competition Rob's Orcs and Goblins knocked out Matt's opposing force also of Orcs and Goblins. WHFB - Nick's Empire fought Dan's Undead. WHFB - Rob and Nick then played a second game. WHFB - Glen's Wood Elves fought against Aaron's Orcs and Goblins. DBMM 15mm - Club Ancients Competition semi-final. Jono (Alexandrian Imperial) beat Philip (New Kingdom Egyptian). The Egyptian superior chariots did well, but not quite as well as the Companions, and Tuthmosis III turned out to be not quite as brilliant as Alexander. Jono progresses to the finals, where he will play the winner of the game between Lee and Brett. DBM 15mm - Michael (Three Kingdoms Chinese) played John (Italian Condotta). DBR 15mm - Scott's Swiss fought against Stu's 17th Century Royal French. DBR 15mm - Andrew's Neapolitan Spanish first took on Ian's German Minor States. DBR 15mm - In a second battle Andrew and Ian fought to a mutual break, this time Ian used Scots Covenanters with Royalist allies. Flames of War - Kendall's new German force fought against Kit who was using Kendall's U.S. Airborne. 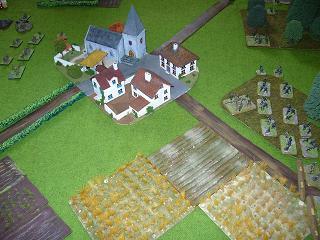 The town of Hunterville (pictured above, and scratch built by No Man's Land) featured in the battle. Next meeting coincides with the Battlecry tournament, so is likely to be a quiet meeting. Today we had a couple of visitors from the AWC, and Scott returned to the club after a long absence overseas. Al brought along some copies of the new moderns army lists, and there were a couple of micro-scale moderns games. WHFB - Dan (Mortal Chaos) and Aaron (Empire) played a game in the Warhammer competition. Although it was a drawn battle, Dan progresses because he had a 150 point margin in the game. DBM 15mm - Philip's New Kingdom Egyptians beat Ben's Abbasid Arabs. An Arab flank march failed to appear and the Egyptian blades defeated the centre of their infantry line. The Arab archers were having the best of an exchange with the Egyptian bows, until some Egyptian chariots and blades came to their rescue. 10-0 to the NKE. DBR 25mm - John and Grant had a battle with Samurai and Monks. Monks won. DBR 15mm - Stu's Montrose Scots defeated the Austrian Imperial army of Ian. DBR 15mm - Scott's Swiss took on the Maximilian Imperialists of John. A resounding win to the Swiss. Moderns - Kendall (Germans) beat Kieran (Russians). Dr Lucky met his untimely end twice more today. As is usual for this time of year, it was a quiet meeting. WHFB - Aaron (Snr) Dark Elf, Rob (Snr) Dogs of War Cavalry and Daniel Beastmen play a mutltiplayer game of Warhammer, eventual winner being Aaron with his Level Two Mage getting the better of Rob's Steed Mounted Paymaster, leaving the mage as the sole remaining model. Flames of War - Kendall Late War Grenadier Company including a King Tiger against Garth's German Para's with Kendall winning 5-2. Modern air combat - Matt and Andrew played with pretty fighters jets. Matt shot down Andrew's planes but was full of holes.